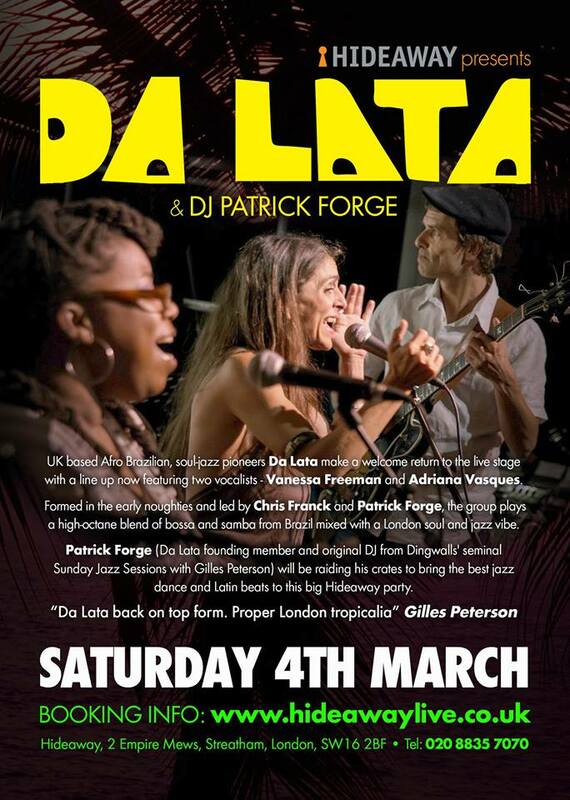 UK based Afro Brazilian, soul-jazz pioneers Da Lata make a welcome return to the live stage with a line up now featuring two vocalists – Vanessa Freeman and Adriana Vasques. Formed in the early noughties and led by Chris Franck and Patrick Forge, the group plays a high-octane blend of bossa and samba from Brazil mixed with a London soul and jazz vibe. In 2013 they released the acclaimed album ‘Fabiola’ on Agogo Records and have since reasserted themselves as leaders of the UK/Brazilian music scene in Europe and the UK. Patrick Forge, Da Lata founding member, original DJ from Dingwalls’ seminal Sunday Jazz Sessions with Gilles Peterson and the man behind the music that is Cosmic Jam (Kiss FM and Mi-Soul), will be raiding his crates to bring the best jazz dance and Latin beats to this big Hideaway party.